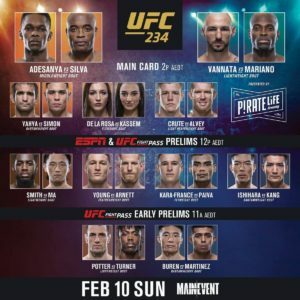 The Ultimate Fighting Championship is at the Rod Laver Arena in Melbourne, Victoria, Australia for UFC 234. The 11-bout Card is headlined by unbeaten Israel Adesanya facing former champion Anderson “The Spider” Silva. The main event had been scheduled to see Kelvin Gastelum challenging Robert Whittaker for the UFC Middleweight title, but Whittaker has been forced to pull out with a hernia. Adesanya has fought in over 30 amateur kickboxing bouts, 80 pro kickboxing bouts, and is 15-0 in MMA. “The Last Style Bender” is coming off a first round knock out of Derek Brunson. Silva will be returning to action for the first time since a unanimous decision win over Derek Brunson at UFC 208 in February of 2017. Elevated from the featured Fight Pass prelim to the co-main event is bonus machine “Groovy” Landon Vannata vs. Brazil’s Marcos Mariano.